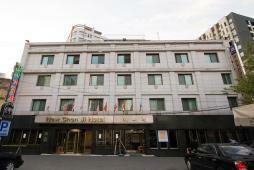 New Chonji Hotel, opened in 1968, is an economic accommodation located in Dongdaemun. It is recommended for those who prefer to dine out and save costs on accommodation. With many renovations, it offers new and improved facilities. There are 51 guestrooms total with a selection of Double and Twin. All rooms vary in room layout and some are equipped with bathtubs and others with shower booths. Guests can also check their email or search travel information on the 6th floor computer with complimentary Internet access. Nearby are also low-cost Korean restaurants, bars and 24 hour convenience stores. Subway lines 2,4 and 5 are all available, so it is easy to reach many tourist locations. Line 4 leads to Myeongdong, Seoul Station and Daehakno, line 2 to Shinchon, Hongdae, Ewha Woman's University and Gangnam while line 5 leads to Jongno 3-ga, Insadong.